Columbus Day Is It? Maybe Next Year We Should Have a Hitler Day! “We Are Still Here” is the first of my Culture Clash collection. The spreading of european diseases to which we have little or no resistance to, this in itself has been said to account for up to %90 percent of the deaths and unfathomable SUFFERING of Native Americans since 1492. Native people are often regarded as a whimsical character from the past that no longer exists except in the imagination of non-natives and in old western movies, this is why our Nez Perce man and his horse are represented in black and white, because many people think of us as something from the past and even talk about us in past tense form. i.e. “The Indians ‘lived‘ in tipis.” or “Native Americans ‘were‘ spiritual and ‘sang‘ songs and ‘danced‘. Well, WE ARE STILL HERE! No need to speak of us in past tense, Thank You, we aren’t quite gone yet – we are making a recovery, remembering our ways and reclaiming our place on Turtle Island. The upside down flag is a well known military distress signal, it means Something Is Wrong and it is a sign asking for help. The burnt edges of the flag are an acknowledgment of the dangerous, difficult and life threatening times Native Activists have gone through and continue to face. Look closely and ponder this work, it has quite a story to tell. I’d like to dedicate this to all Indigenous Activists, to all those who dare to DEcolonize their mind and to all the Survivors who stayed and stay strong with love in their heart for all of our Relations. I hope you get as much out of it as I put into it. Would you celebrate a “Hitler Day”? Well if not then why in the world would you EVER celebrate this person who started a holocaust that killed about 10 times as many people as Hitlers claim to infamy? 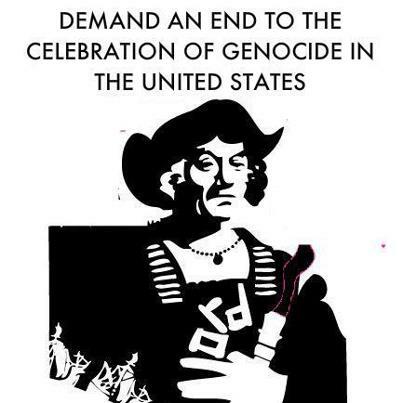 Whether the death tolls be 6 million, 45 million or 90 million we should all be able to agree that it is all horrific and awful and that starting a 500 year (so far) long genocide is NOTHING to celebrate!